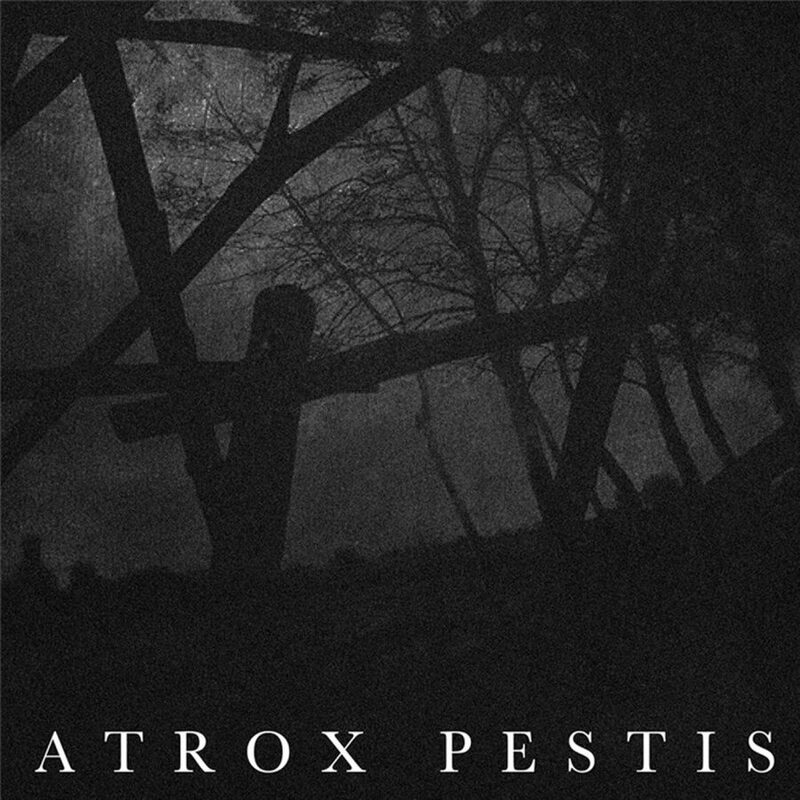 Atrox Pestis is the blackened dark ambient side-project of Grant Richardson, best known for his death industrial work as Gnawed. Through the Gnawed project, we are used to hearing an intricate and disturbing blend of decrepit industrial noises coming from the deep recesses and forgotten districts of his city. Richardson is known for incorporating field recordings, collected from just such places. So it wasn’t a stretch for him to branch out into the dark ambient genre for the self-titled Atrox Pestis album. Atrox Pestis is a natural evolution from Gnawed. Richardson already had plenty of dark and brooding passages on his latest Gnawed album, the brilliantly executed Pestilence Beholden. With Atrox Pestis we get a lot more of a good thing. The sounds are cavernous, subterranean ventures. They are complex with a vast array of sounds displayed. “With Seven Tongues He Spoke” is based in a hollow and lightly rumbling drone. It is decorated with a plethora of industrial noises, metal clanging, blood-curdling metallic grinding noises and even more layers of the hollowed-out drone work, much of which appears to be based in field recordings as opposed to synthesizers. As the track progresses we are presented with a quasi-religious element. There is a voice chanting drawn out and malign notes. This description must sound much like something from raison d’être. Yet, the sounds produced here have a defined originality, using some similar elements, but to a totally unique manifestation. The flip-side of this release, “Tourniquet” also comes in at roughly 20 minutes, like “With Seven Tongues He Spoke”. While the first track was a studio production, this half is taken from a live performance in Minneapolis. My initial reaction was one of skepticism. Live tracks can often provide a mediocre addition to physical releases. But, here the track sounds just as well executed and polished as its other half. “Tourniquet” follows much the same framework as “With Seven Tongues He Spoke”. There are numerous field recordings and drones. But this track takes on a bit more aggressive nature. There is a prominent droning noise, which sounds like it could as easily be a bass guitar as a synthesizer. At some points it screams with feedback, but never to a level of irksomeness. Through the progression of the track we again here the chanting vocals, giving the entirety of the album a sort of irreligious vibe. Placing these semi-religious elements among the industrial squalor leaves the listener with an impression of some post-apocalyptic death cult. A group of desperate and filthy heathens who have lost all sense of hope in their old god, now searching for ones that can show them real results. Their grimy faces cast ahead, absorbing the heresy of their wretched new faith. Incense clouds the rotting cathedral, giving them a brief departure from the putrid smells of this cancerous and dying civilization. The future seems particularly bleak, which is clearly the impression Atrox Pestis intends to convey. This self titled album was originally released on a limited lathe 12″ but is now re-released as a C45 cassette, through Richardson’s label, Maniacal Hatred. While the cassette is already sold out from Maniacal Hatred, as of this publication there were still some copies to be found on Malignant Records mailorder page. The digital version can be purchased indefinitely through the Maniacal Hatred Bandcamp page. The debut of Richardson’s dark ambient project is overall a brilliant composition. Both tracks fit within a similar framework to keep a consistent atmosphere throughout the album. I wonder if this is the first or only album by Atrox Pestis. I would be happy to hear a proper full length release under this moniker. Richardson plainly took caution and executed this release with precision, unlike many dark ambient releases which seem to be emotionless and futile. I would recommend this album especially to listeners that enjoy their dark ambient on the slightly harsher and more industrial side. Death-industrial fans will surely find much to love here as well. We can only hope the future of this project has more to offer on this caliber of craftsmanship.